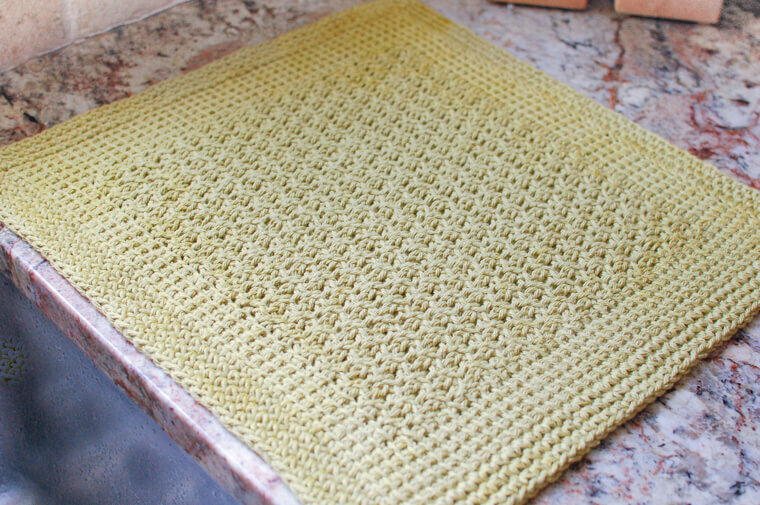 I’m continuing my kitchen crochet series this month with this pretty Tunisian Crochet Dish Drying Mat Pattern. I love pieces that are attractive yet functional and that’s exactly what this drying mat is. The cotton yarn dries quickly and can be thrown in the wash over and over again. If you missed any of the kitchen patterns so far, you can click here to see the full collection of kitchen and dining patterns. I’ve especially been enjoying seeing all the different dishcloth variations you’ve been making on Ravelry. If you haven’t tried one yet, you will definitely want to … they are so much fun! I have included the direct links to each of those patterns below the photo here so you can quickly jump to the one you want. 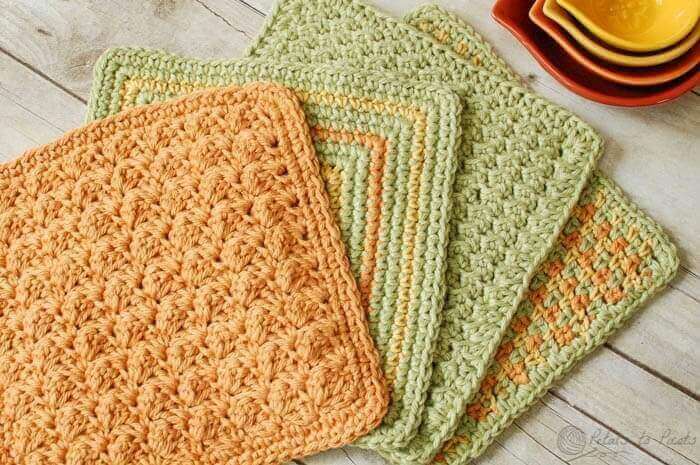 From left to right: Textured Dishcloth, Seeing Squares Dishcloth, Crunchy Stitch Dishcloth, and Three Color Simple Stitch Dishcloth. Resources and tutorials you may find helpful in following this pattern: Tunisian Crochet Abbreviations and Symbols, Basic Forward and Return Pass, How to Crochet a Tunisian Knit Stitch (Tks), How to Crochet a Tunisian Purl Stitch (Tps), How to Crochet Tunisian Simple Stitch (Tss). When working your forward pass, the loop on your hook counts as the first stitch. Therefore, when the pattern indicates to work 5 TSS, the first is already on your hook; pull up a loop in the next 4 stitches to complete the 5 TSS indicated. The last stitch of each row should be made through the two end loops of row below. A basic return pass should be used throughout (i.e., yo, draw through 1 loop, *yo, draw through 2 loops, rep from * across). Add new color on the last yarn over of your return pass. Finished mat measures approximately 16 in × 17 in. Rows 1–6: Work Tss in each st across — 46 sts. Row 7: Work 5 Tss, *sk next vertical bar, pull up a loop in next vertical bar, pull up a loop in skipped vertical bar (cross st made), 2 Tps, rep from * until last 5 sts, work 5 Tss — 46 sts. Row 8: Work 5 Tss, *2 Tps, sk next vertical bar, pull up a loop in next vertical bar, pull up a loop in skipped vertical bar (cross st made), rep from * until last 5 sts, work 5 Tss — 46 sts. Rows 9–40: Repeat rows 7 and 8 for pattern. Rows 41–46: Work Tss in each st across, return pass — 46 sts. Round 1: Ch 1, work a sc border around piece by working 1 sc at the end of each row and in each st and 3sc in each corner, join. Rounds 2–3: rep round 1. Block blanket if desired (see How to Block Knit and Crochet Items). Click here for more Tunisian Crochet Patterns. just curious as to why the pattern tells us we need to know the tks when there is not one in the pattern? is it a typo in the pattern or are there actually only tss and tps? Beautiful series. Love this mat, thinking of making a set of 4 as place mats for my son’s fiance. Thank you for sharing your hard work, it is much appreciated. I love this. I have never tried the Tunisian purl stitch. This past year was the first I ever tried crocheting a tunisian scarf. I can’t wait to give this one a try! Thanks! Não leio e não falo Inglês,obrigada. This looks like it would make an awesome door mat. I love tunisian crochet. Do you have the Tuscan dishcloth pattern posted somewhere? Hi!! I love this idea for a dishmat!! Is it possible to make this with regular crochet? I’m not familiar with Tunisian style. I would love to make this for a gift!! Kara could you design a Tunisian square that is smaller to use to set hot dishes and pans on? Could anyone tell me approx. how much yarn was used? I have 2 different 120yd. balls of Peaches and Cream and wanted to know if I would have enough to maybe make it a little larger. After completing the return row (46), do I single crochet into the “squares” formed by the way the return row is worked? Thank you in advance for your answer! Love this pattern. I have done very little tunisan crochet (I mostly knit) , so I’m not very adept at seeing pattern repeats. I want to make this a little wider and longer. Of course, longer isn’t the problem 🙂 ! Is the cross stitch pattern a 4 stitch repeat? If so, I could add multiples of 4 to make it wider, right? I tried clicking on Tunisian cross stitch pattern from The New Tunisian Crochet by Dora Ohrenstein, before I posted and it took me to some blue book website, so I will try this link instead. Thanks for the quick response. Brenda, there are several vidoes on YouTube for Tunisian instructions. I have also found some other sites as well when I searched. Hope this helps..
Hello, is there some place on your website that tells about tunisian crochet? I have searched around and don’t seem to find it. I get taken to all sorts of places with books to buy, etc. but nothing to explain how to do it. Guess I can go to youtube. I am working your pattern now. After the first 6 rows I had to restart the pattern several times because I was ending with an uneven count before the last 5. I also found that I had a border of 6 on the start and 5 on the end. So I started working 4 TSS instead of 5 and I seem to be equal now in both sides. Don’t know if I’m doing something wrong, but it seems to be working. Thanks Kara. Although I am experienced with Tunisian, it’s been years since I followed a pattern and I forgot first loop on hook counts as #1. There may be some who never worked in Tunisian … your clarity will definitely help. I have a friend who is unhappy with her new granite and wants to cover it … This mat will help! 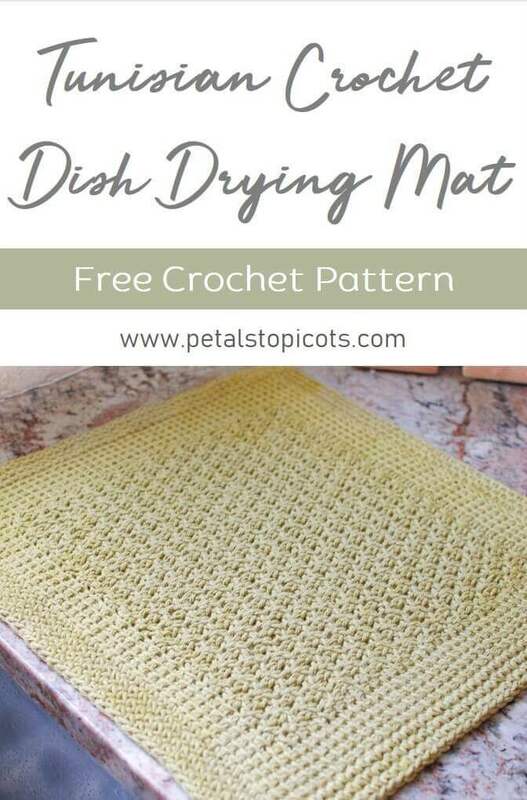 Cute pattern, will have to try it (I use a dish mat daily). Most Tunisian tutorials I have learned from automatically account for the stitch on the hook, so you do not need to count it. In otherwords, they don’t mention it nor do they add it to the pattern as a numbered stitch. I much prefer this, as it is way less confusing? The other way feels like we’re adding a stitch in the numbers but then mentally taking it away in the work. Just leave it out of the numbers in the pattern (so decrease all numbers by 1 throughout) and you don’t have to think about it at all. Great tutorials on Tunisian can be found at stitchdiva.com (I am not affiliated, but just benefited from her videos). Hi Kara!! Thanks for all the info on these cute cloths. I ‘m in the process of Tunisian crochet blanket. My hook was made for me by a friends husband. it measure 36″. A hook at each end. I put on a chain of 165 stitches. then I take them off and pout them on……Not exactly in that order. There is a pattern. I’m going to see if I can follow your pattern for the mat. Thanks for sharing!! The multicoloured one is my favourite 🙂 Hopefully, I will learn Tunisian crochet someday. Too many things to learn, too less time. I m going to try this this afternoon! love it and i use a drying mat (ok a kitchen towel as a drying mat!) everyday. I use it everyday … Except when it’s in the wash. Hope you like it too! I finished it and will try to post a pic – haven’t posted much myself but love looking at everyones photos of their beautiful work! Thanks so much for all your patterns!! Kara, this pattern is awesome. I definitely need to learn this new crocheting technique. Do you have any tutorials on your blog? No, I don’t. I’m sure there are some online though. I really love Tunisian! Thanks so much for all the patterns , Love crocheted dishcloths ! 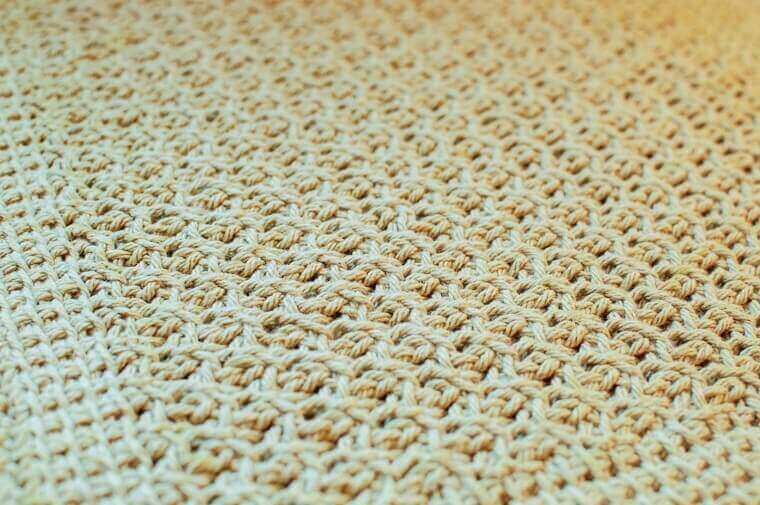 I haven’t tried Tunisian crochet but your mat is beautiful !